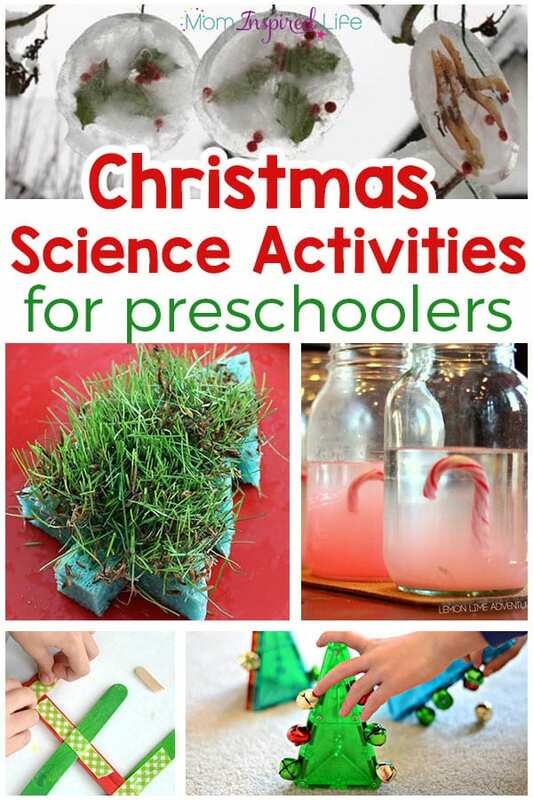 These Christmas science experiments for preschoolers are jam packed with fun and excitement. Make this holiday season one filled with wonder and exploration! 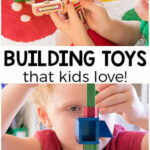 Kids love to explore how things work, test their ideas and engage their senses. When you combine that with Christmas inspiration, the fun factor really increases. 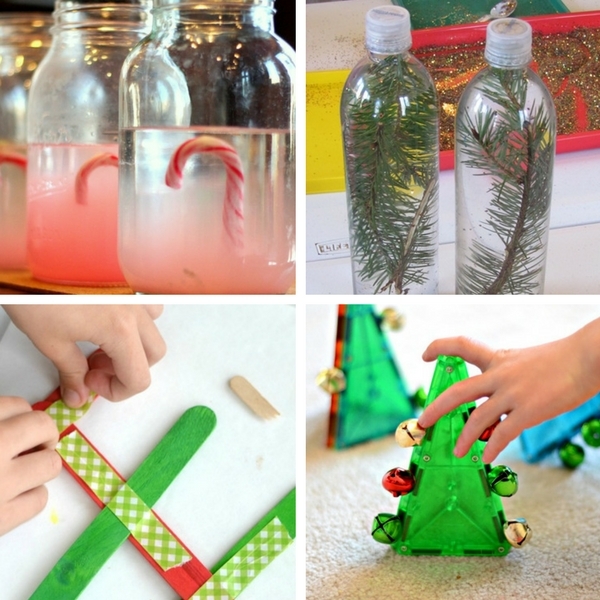 All of these Christmas science experiments and activities are hands-on, engaging and fun! The best part is that most of them require very few supplies and you probably already have many of them in your home or classrooms. So why not add some science exploration to your plans this Christmas? 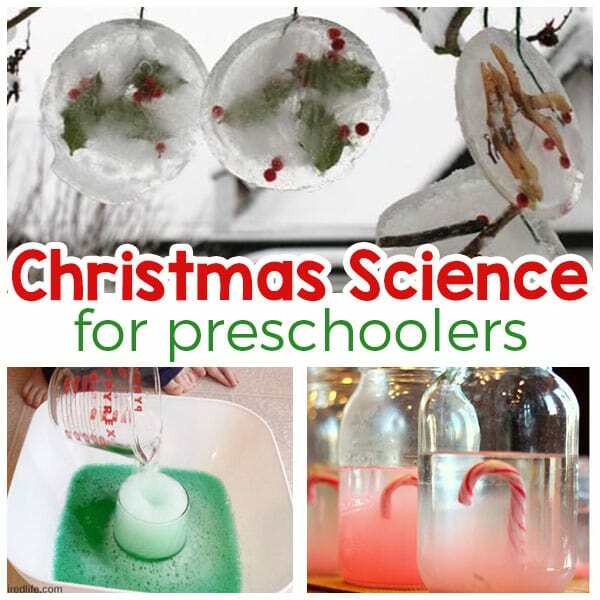 These Christmas science experiments for kids that are sure to bring your kids joy and excitement this Christmas season! 1. This Christmas lava lamp experiment is totally awesome! It is always a hit with the kids. 2. 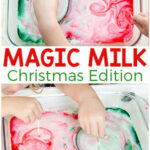 Make a Christmas version of the classic magic milk experiment and totally WOW your kids. It is so easy to do too! 3. 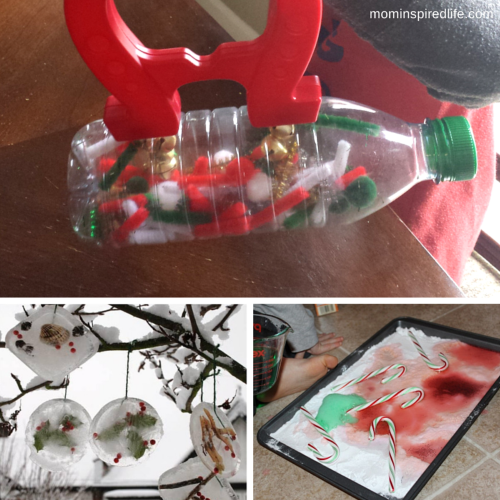 Magnetic Christmas Science and Sensory Bottle – Explore magnetism with this neat Christmas sensory bottle! 4. Ice Ornaments from Red Ted Art – make really cool ice ornaments by leaving decorated water outside to freeze. 5. 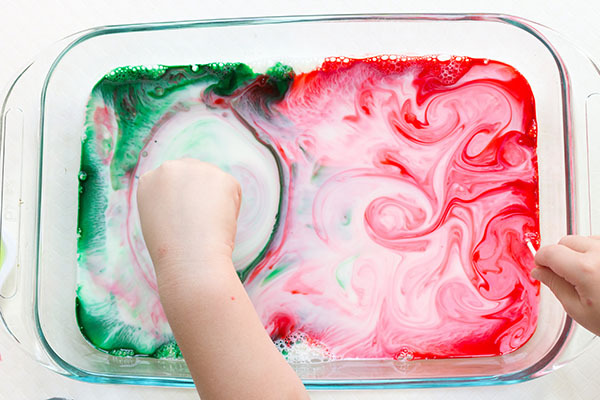 Fizzing Candy Canes from Teaching Mama – See what happens when you mix candy canes, baking soda and vinegar. 6. Melting Snow Science Experiment from Mom Inspired Life – Does salt effect how quickly the snow melts? 7. 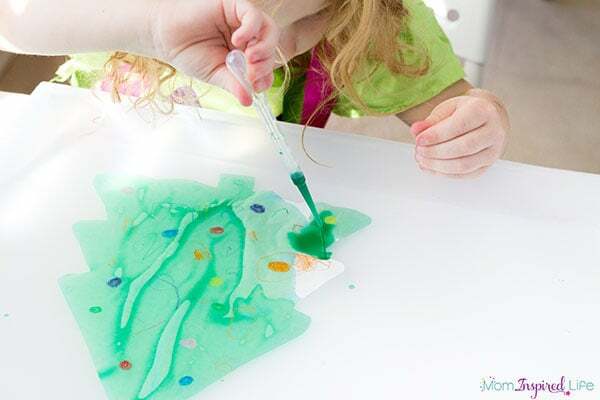 Christmas Tree Slime from Little Bins for Little Hands – this slime is so much fun to play with and so pretty to look at! 8. Exploring Pine Trees from Inspiration Laboratories – get out your science tools and investigate pine needles. 9. Christmas Candy Dissolving Experiment from Little Bins for Little Hands – test how quickly Christmas candy dissolves in different liquids. 11. 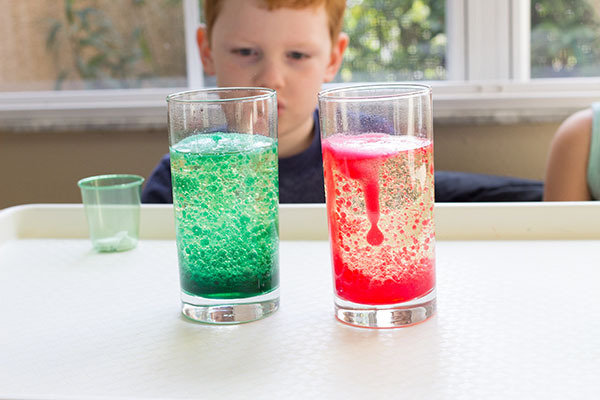 Snow Science Experiment from Inspiration Laboratories – test whether snow melts faster in the house, the refrigerator or the freezer. 12. 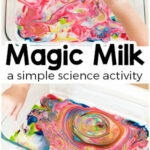 Surprise Christmas Color Eruptions from Mom Inspired Life – this tricky chemical reaction will really excite your kids! 13. 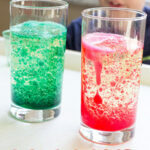 Experiment with dissolving candy canes in various liquids. 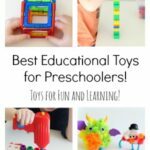 This is super simple to set up and perfect for preschoolers! 14. 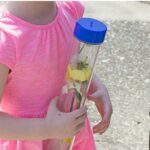 These pine needle discovery bottles give young children a chance to explore pine needles and make their own discovery bottles! 15. Set out a bunch of simple supplies and invite your kids to make a sled for Santa. 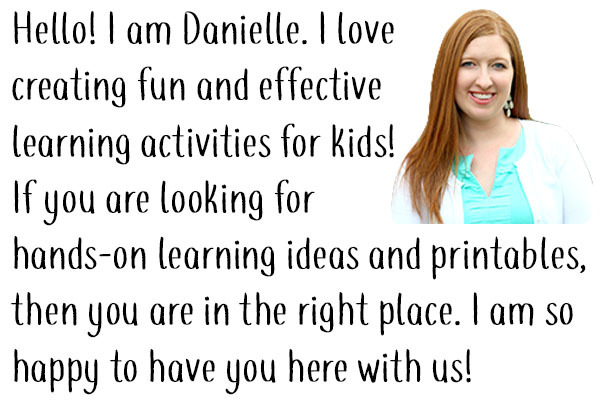 This STEAM activity is sure to be a hit with the children in your life! 16. Give your preschoolers a chance to explore magnets and engineering with this totally awesome Christmas magnet activity! 17. I bet your kids would love the chance to grow a crystal tree this Christmas. 18. Pick up a copy of this popular Christmas book and learn about the senses with this engaging hands-on activity! 19. This dancing jingle bells science experiment is super cool! My kids can’t wait to try it this year! 20. Experiment with static electricity this Christmas season. You only need two simple supplies. If you are a teacher, this would be an excellent exploration activity for your science center! 21. 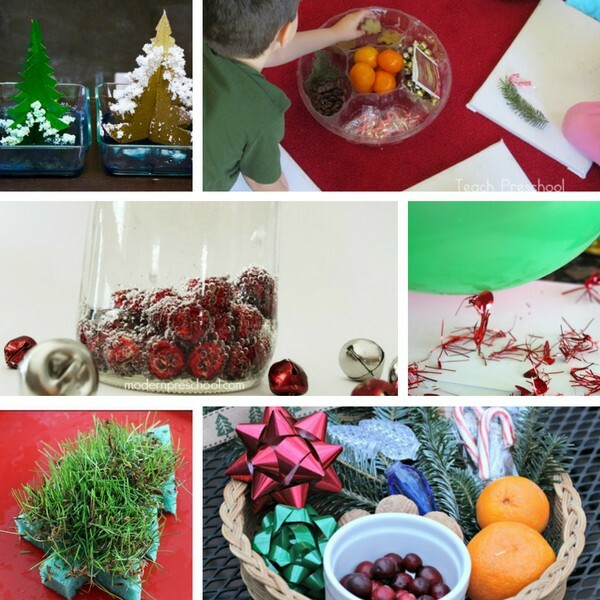 Grow your own Christmas tree sponge with this exciting activity that teaches kids about plant growth and gives them a chance to develop their fine motor skills. 22. I absolutely love this Christmas-themed sink or float exploration! 23. 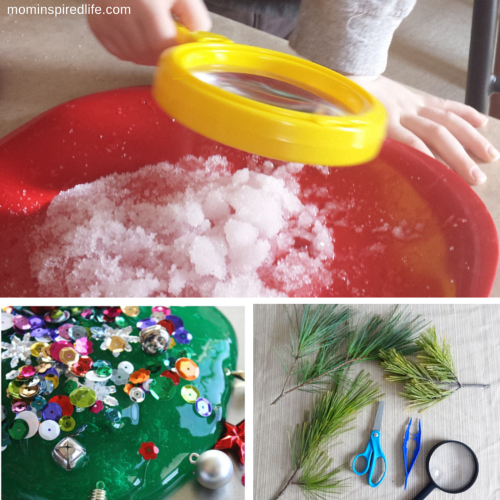 Combine science and art with this engaging Christmas suncatcher activity! 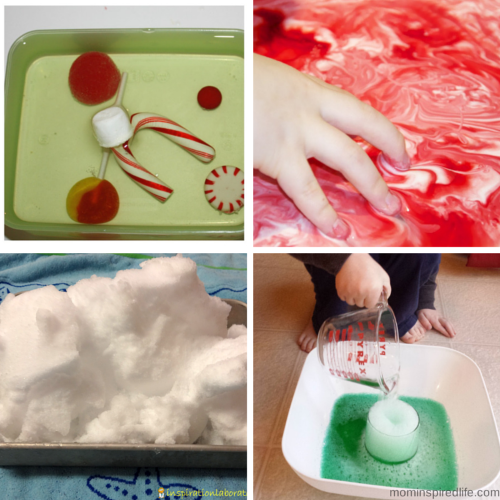 I hope you find this list of my favorite Christmas science experiments for kids helpful. We can’t wait to do many of them this Christmas season! 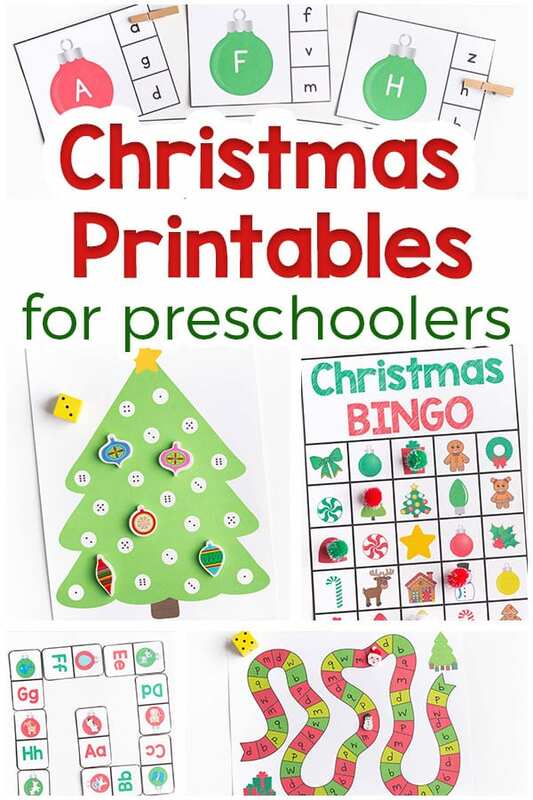 Here are some more playful Christmas learning activities!